As The Camper Trailer of the Year winners four years running, the Queensland based juggernaut that is Patriot Campers continue to smash it out of the water. 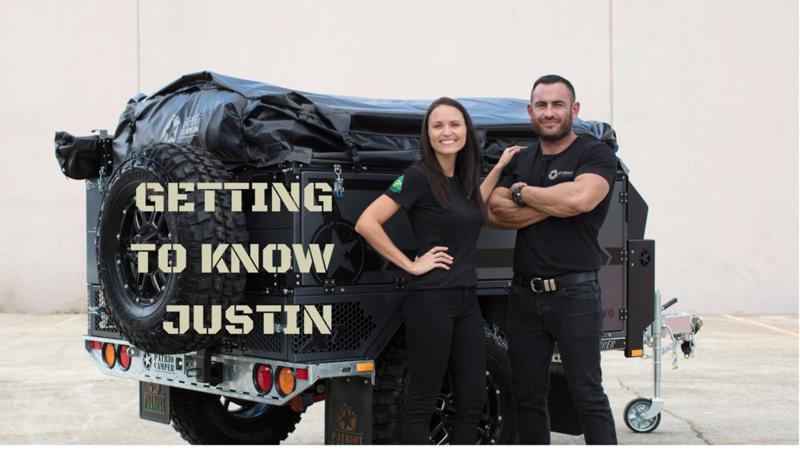 The team have seriously disrupted the camper trailer market thanks to their rugged, no-nonsense camper trailers, so much so that they're now starting to pique America's interest. We sat down with the brains behind this operation, Justin Montesalvo, to talk about how this now iconic business was born and his proudest moments since launching the brand only four years ago. The Patriot Camper story sounds like a dream. 4 years ago when you started brainstorming ideas for the ultimate camper did you ever expect it would one day get the amount of traction and industry notice that it did? The concept for the first X1 came from a place of necessity. I’d owned camper trailers before and they didn’t perfectly suit my needs, so I designed the X1. Knowing that I’d created a tailored product for how my mates and I tackled the outdoors, I kind of knew that it would be well received. ...I’m still very proud of the attention our product has received though! Patriot Campers is Australian-made and the quality of the build shows. How important is it to you to keep manufacturing in Australia? The twins (Christian and Ashton Montesalvo) are in at Patriot working every school holidays. They’re one of the boys' and they clock on and off like the rest of the team on the production line. Knowing that maintaining a 100% Australian manufactured product will help our Aussie workforce is a special feeling. We proudly wear the Australian Made logo on our sleeves, literally, and while there was a time when overseas manufactured camper trailers were attempting to grow their marketshare, the Australian public realised that the perceived premium price of Aussie manufactured products was worth it. The best part of my job is getting in front of our customers and hearing how excited they are to explore our country with a product that I designed four years ago. The hardest part is producing a premium quality product for a price that the Aussie market can sustain. We work really hard to price our products as fairly as possible whilst maintaining the Australian Made status. Knowing there are customers out there who would love a Patriot Camper but may not be able to afford it is tough. That’s why we designed the X2 at a lower price point! Last year, you launched Patriot Campers TV series which then morphed into Patriot Games, tell us the idea behind that and why you have chosen to go down this route? ‘To the Top’ was entirely an accident. We took a cameraman to Cape York to film some RnD filming and on the first night he came to me and told me that we had something. He asked to film the trip as a reality TV show and when we got back to Patriot Campers HQ weeks later and edited the footage we knew we couldn’t keep the footage to ourselves. Patriot Games was very much an evolution of this. We test our gear like no one else and with our entrance into the USA we knew, once again, that we couldn’t keep the footage to ourselves. You’ve made it no secret that you wish to take on the States, what do you think Patriot Campers can do that is not currently being done over there? Quality and durability. The X1 and X2 are like nothing that market has ever seen, to the point where we actually need to educate the customer about things like Battery Management Systems! Obviously winning Camper Trailer of the Year every year since Patriot Campers began is pretty special. It’s proof that we’d designed a product that the market wanted and still want today. What’s your number one tip you’d give to someone wanting to travel around Australia? Go off grid! Everyone knows that the Patriot Campers trips are as remote as possible and it’s really the best way to explore Australia. Having the ability to stay off the grid for days at a time is essential to the way I travel. Favourite tune on the road? Anything cooked in the camp oven is a must for me. A roast chicken, some wine, whatever veggies you’ve got - chuck ‘em in and sit back with a beer! What is the number one gadget you have installed in your camper trailer? With all the filming we do for Patriot Games, the charging stations and REDARC Battery Management System are essential. Being able to charge the gear off the trailer in remote areas is pretty cool! We’ve been working together now for a number of years, what do you feel makes this partnership so successful? Design is my forte. And with great design comes innovation. I feel like REDARC and Patriot Campers continue to innovate in the overlanding world by collaborating closely on projects. And obviously, as all the REDARC gear that we use is Australian Made, it’s a perfect match! Having lived and worked in Gunbalunya and Maningrida, would love to experience NT, your way.